New England Central 608 at Stafford Springs, Connecticut: Part 1. 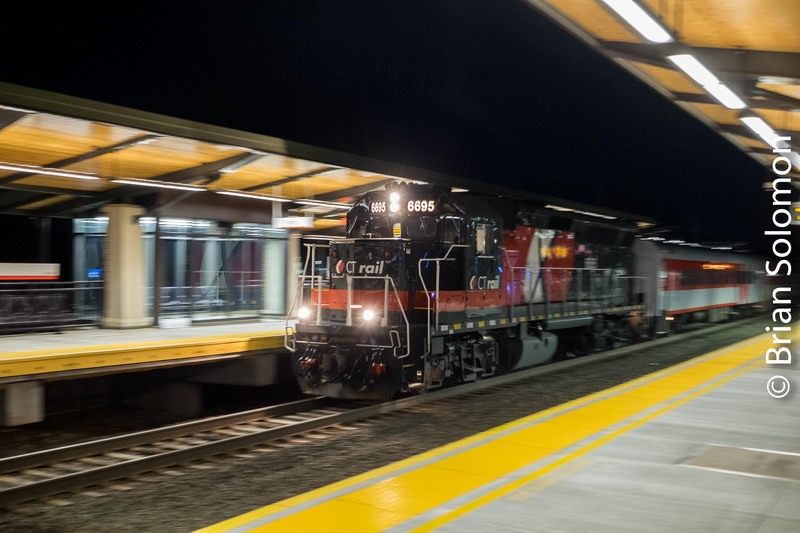 In recent months, New England Central’s Willimantic-Palmer freight, job 608, has been largely nocturnal while the railroad undertook a major rehabilitation program. New rail, ties and crossing protection have been installed. The switches at State Line are improved. And the railroad is in the best shape it’s been in decades. Monday morning, December 10, 2018, I heard 608 working north through Monson. That afternoon, I heard the train on its return run. So Pop (Richard J. Solomon) and I headed out to intercept it. We caught it at both ends of the siding at State Line, then proceeded to Stafford Springs, where I made these views using my FujiFilm XT1 fitted with 12mm Zeiss Touit lens. High contrast low December sun proved challenging. To make the most of the light, I applied an external graduated neutral density filter tapered and positioned to hold the sky exposure. In post processing, I worked with camera RAW files by lightened shadows, darkened highlights, and reduced overall contrast while warming color temperature and slightly boosting saturation. Camera produced JPG using the ‘Velvia’ color profile. Other than scaling, this image was not modified in post processing; color, contrast etc are a result of the pre-profiled JPG setting. This version was adjusted from the Fuji RAW file and reflects the changes discussed in the text. File adjusted from the camera RAW. As we departed Stafford, I noticed a better angle to catch the train. Stay tuned! Amtrak’s Crescent at Birmingham, Alabama. Well I can tick off this state. December 16, 2018, I made my first ever photo on the ground in Alabama, when I got off the Crescent during its station stop. Using the rear display extended, I held my FujiFilm XT1 low to the platform for this dynamic angle of Amtrak P42 126 that was leading train 19 southward toward New Orleans. Ten minutes later I was in the diner and on the roll southward again. Engine Change at New Haven. It’s the ‘blue hour’ at New Haven, Connecticut. Amtrak’s Vermonter is one of a few trains that still changes engines at New Haven, as result of it running through from non-electrified territory to the north. In the case of Amtrak 55, the common GE-built P42 diesel (number 192) was exchanged for a Siemens-built ACS-64 high-voltage electric. 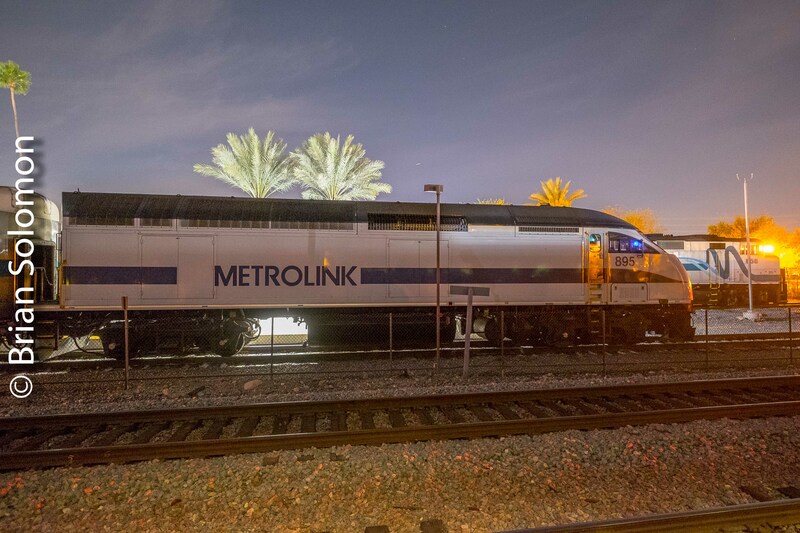 Amtrak added a coach to the front of the train too. A wise move considering how crowded this train is. Working with my FujiFilm XT1, I set the camera to ISO 1600 and the white balance to ‘auto’, and made some photos from the platform during our 24-minute pause at New Haven Union Station. Video uploaded from my iPhone. CTrail 6695 on the Move. On the evening of December 4, 2018, I panned CTrail train 4461 led by engine 6695 at the new Berlin, Connecticut station. 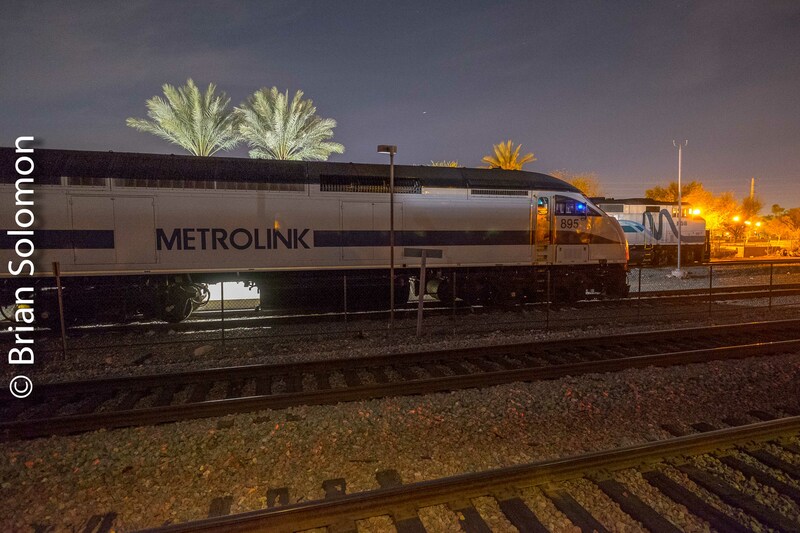 Berlin is brightly lit and makes for a good vantage point to watch and photograph passenger trains on the Hartford Line. To make this pan photo, I set the shutter speed at 1/30thof second, fixed a point in my view finder and moved my camera and body in parallel with the train in a smooth unbroken motion as it arrived at the station. New Haven bound Trail 4461 arrives at Berlin, Connecticut on December 4, 2018. Panning is a great means to show a train in motion. Irish Rail 077 with Belmond; Three Days—Harsh Light, Soft Light and an ICR. Over the last few days, I’ve intercepted Belmond’s Grand Hibernianin my neighborhood three times. 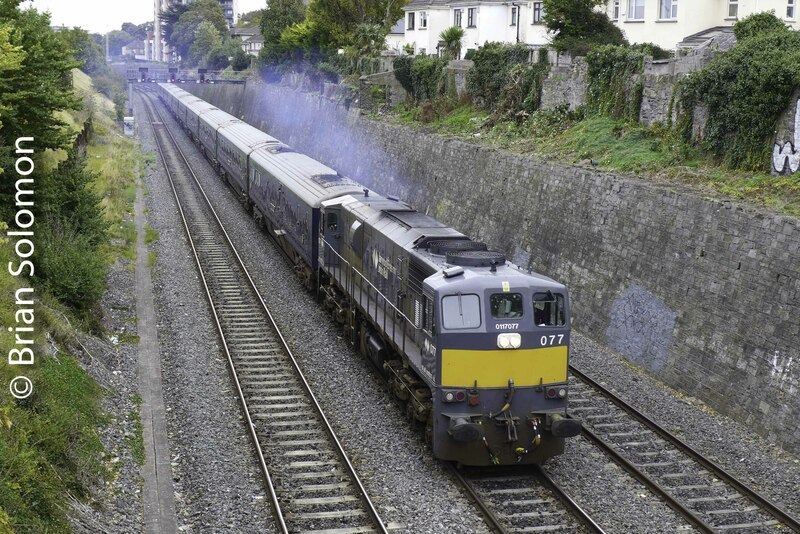 All hauled by Irish Rail class 071 number 077. In each instance the lighting was less than calendar perfect. In each instance I made digital images to best suit the scene. 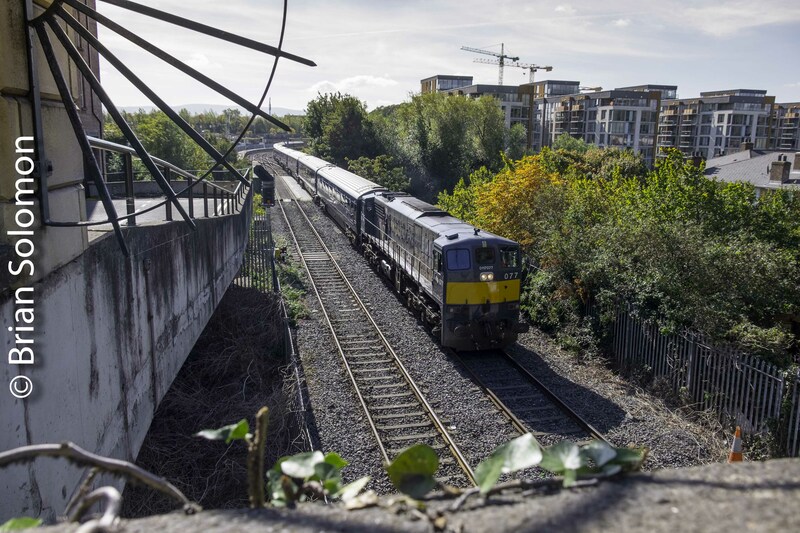 Hints of autumn foliage dot the Dublin landscape, and soon Belmond’s train will conclude its touring season. 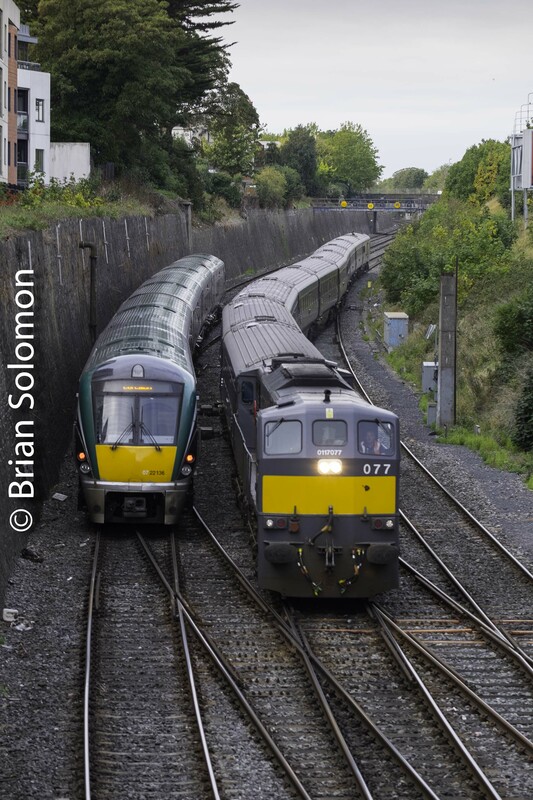 Irish Rail 077 approaches the Phoenix Park Tunnel. Backlighting helps accentuate autumn foliage. FujiFilm XT1 with 18-135mm zoom lens. 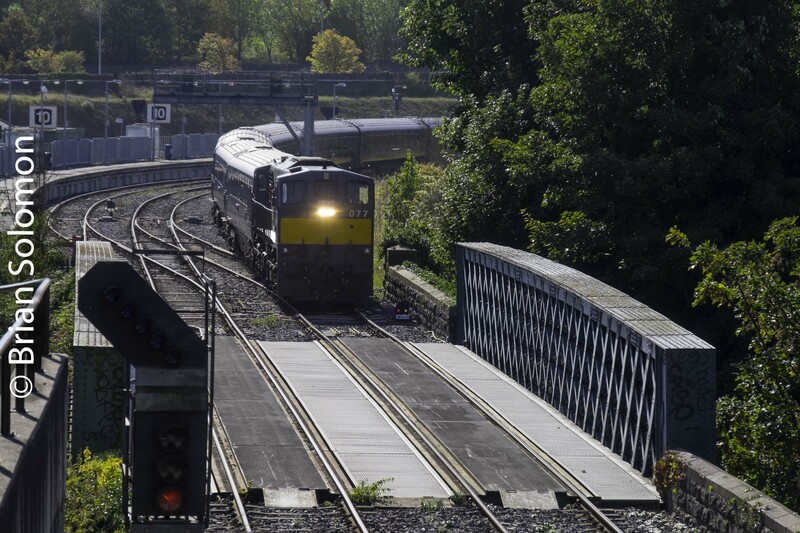 Wide angle view from the same vantage point as above: Irish Rail 077 approaches the Phoenix Park Tunnel. Backlighting helps accentuate autumn foliage. FujiFilm XT1 with 18-135mm zoom lens. Sunday morning at Memorial Road, Irish Rail 077 works towards Waterford. Lumix LX7 photo. 30 September 2018. The Grand Hibernian working toward Heuston on Monday 1 October 2018 passes and Irish Rail ICR in the gullet. Fujifilm XT1 with 90mm lens.